Steve Ballmer revealed his problems with the iPad and his love for mobile phones in an interview this week. Speaking to Cnet, Ballmer explained that the iPad was a decent device but not for everyone. When asked about the iPad he noted that he sees too many of the devices around, explaining: "You certainly see more than I would like. One is more than I would like." When queried on the iPad's form factor he said: "Someone who wants to sit and do an interview and take notes and scroll around, they are unlikely to find that device very comfortable. "It doesn't stand up on its own. It doesn't have a big screen and keyboard. "I'm not taking anything away from what Apple has done and certainly we have our work cut out for us." Ballmer also explained his love for phones and how his mobile is a key device for him, which is not that surprising given the interview took place was at a Windows Phone 7 event. 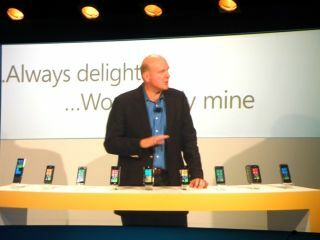 That aside, Ballmer explained how he uses his phone: "There's very little I won't do when I am on my phone," he noted. "I certainly do the typical email. I make phone calls, not surprisingly, a lot of them and I don't want those phone calls dropped. I actually am fairly active on Facebook." "I actually am fairly active on Facebook" sounds like a Ron Burgundy boast ("I'm kind of a big deal") but it does show the importance of mobile connectivity for the Microsoft boss. He continued: "I do, in fact, travel a lot, so the fact that I can take my Office with me is important. "And I can take some videos to watch and music to listen to. It's all great for me as a mobile person." So there you have it. Ballmer is a mobile person, who is fairly active on Facebook and has a phobia of iPads because they don't stand up on their own.